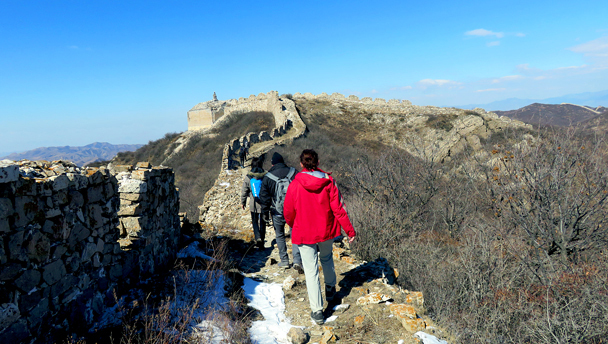 In Brief: Fifteen photos of a late-winter hike at the old and rough Zhenbiancheng Great Wall. 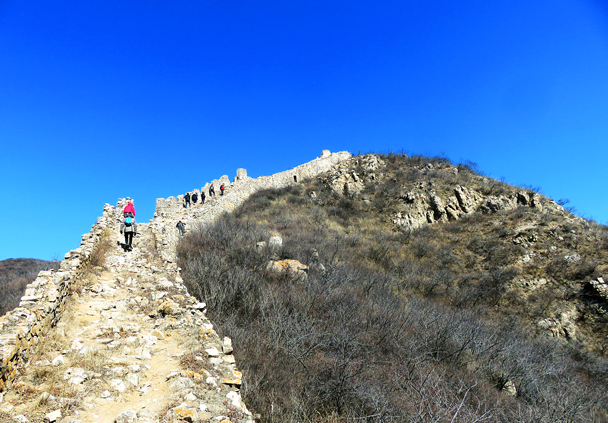 Up on the Great Wall at Zhenbiancheng. 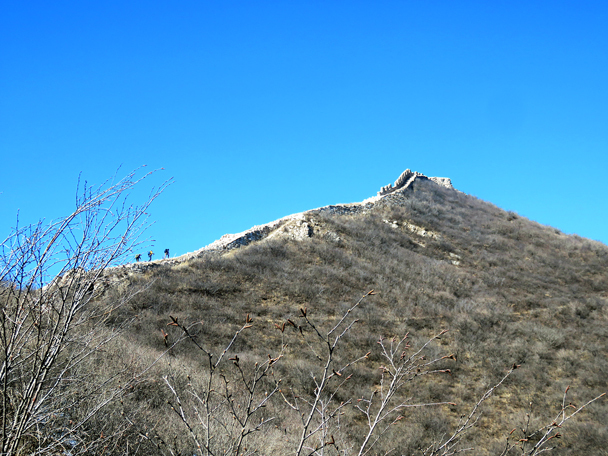 There’s a line of Ming Dynasty-era (1368-1644) Great Wall that runs through the mountains in the northwest of Beijing, and Zhenbiancheng is right at the far western end of it. 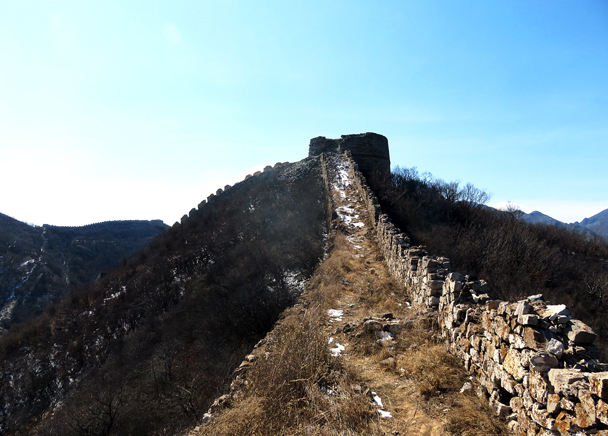 Construction started at the western end, which makes Zhenbiancheng some of the oldest Ming Dynasty Great Wall in the Beijing area. 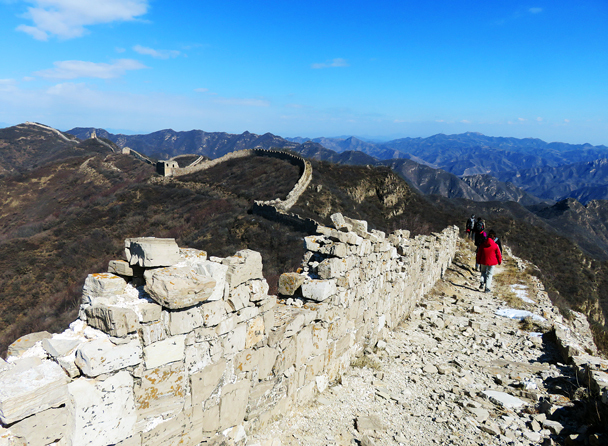 What makes this section particularly interesting is that the parapets and fortifications are all made out of stone and the inside of the wall is made from brick. 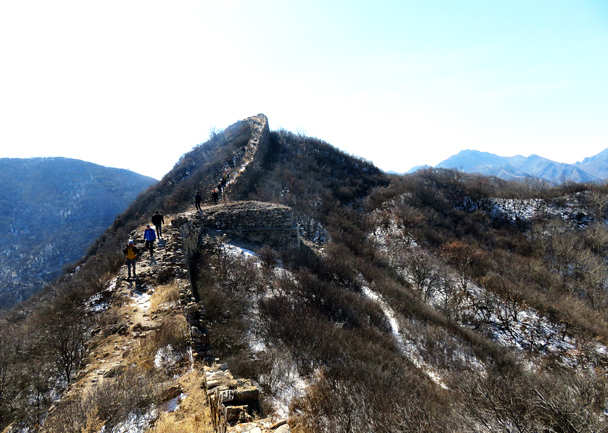 It is also one of the few sections of wall that has round towers. 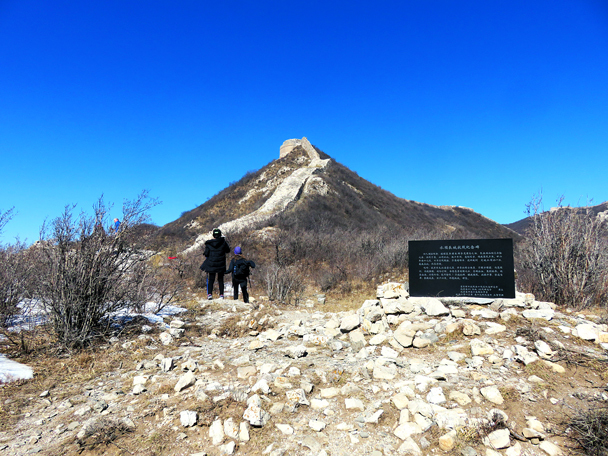 On this day we had clear skies, quite a bit of wind and even found some snow on the trail. Scroll down to see pictures from the hike. 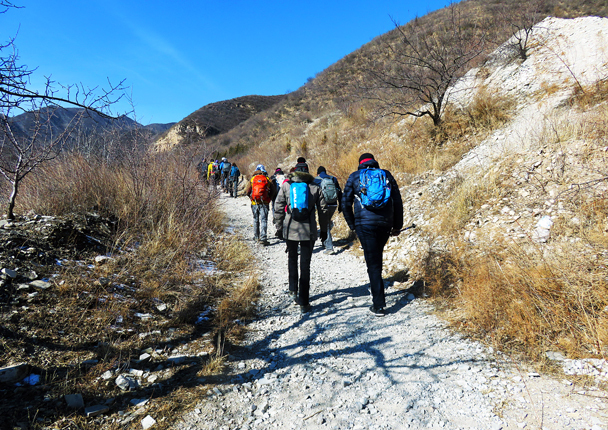 This hike starts on a gravel road that winds through a terraced valley. 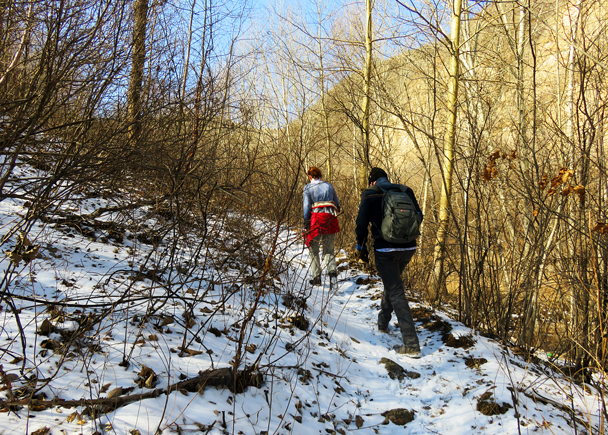 It snowed a couple of days before the hike, and we were surprised to see this much snow still on the ground. After a long walk up the valley the wall is almost within reach. At the base of this section sit a large commemorative stone for soldiers who died here fighting the Japanese army in the late ‘30s. Up on the hill you can see the base of one of the round towers. In the ‘30s this tower was still mostly intact. The group takes a break to wrap up against the wind. A beautiful day for a hike! But we’ve got a steep climb coming up. 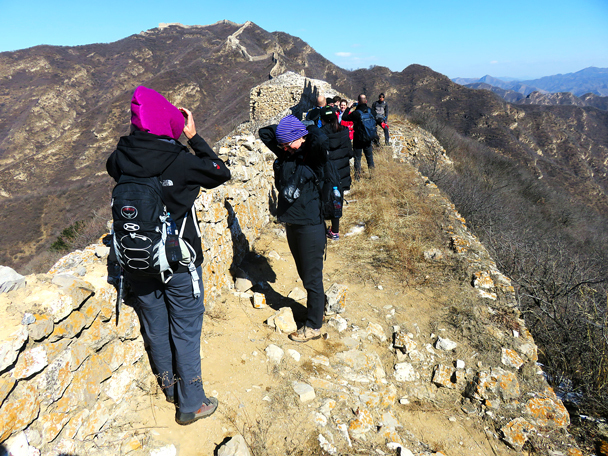 The broken bricks and crumbling stone make this section of wall trickier to walk on than other parts of the wall. 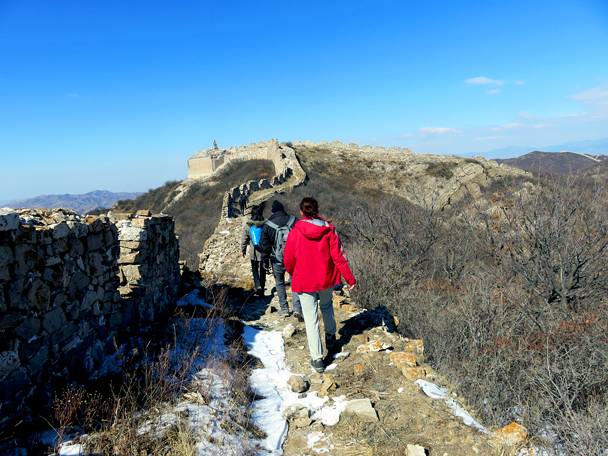 The hikers pass the base of an old tower. 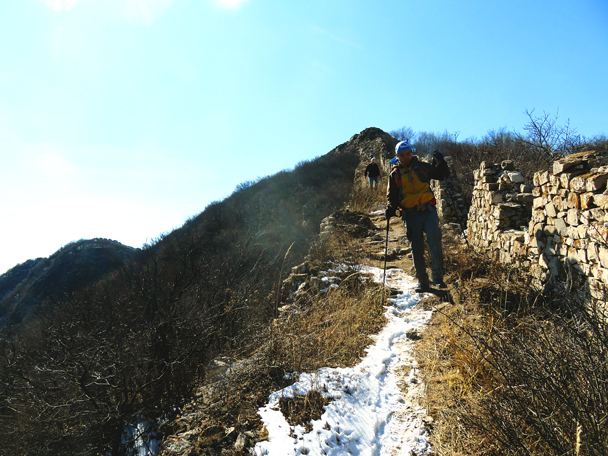 A hiker carefully navigates a tricky section of dilapidated stairs. Heading for a high up tower that is positioned for its long views north. 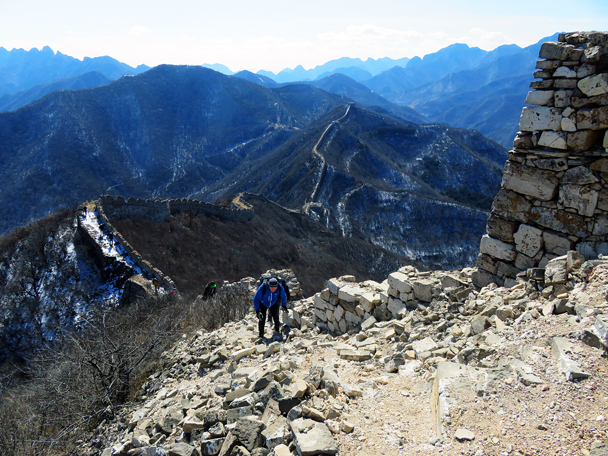 In the middle of the photo is an interesting feature – the line of wall curves up to stay on the highest ground, with a cutting running in front. We think they used the cutting as a source of stone for the wall, and it also makes it more difficult to attack. More snow; a little slippery. This photo is from the bus ride back to Beijing. 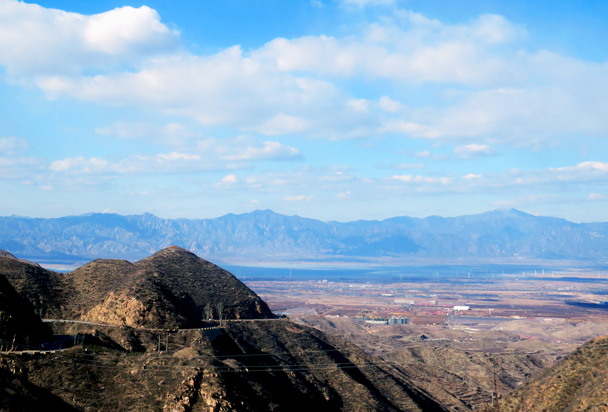 The flat plain between the mountains was one of the main routes through to Beijing, which is why there’s all the Great Wall around here. 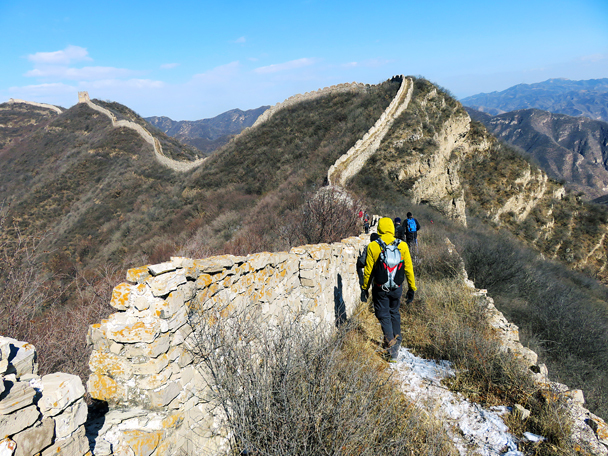 It’s still one of the main routes to Beijing, but via motorway instead of horse (or camel! ).